Creating beautiful eyelids is very rewarding. Changes around our eyes are where some of the earliest signs of ageing are noticed. It is where we look when we interact with other people. Following surgery many people comment that their eyes look more open and feel less heavy. Often they will notice their peripheral vision has improved. Hooded eyelids and obliteration of the skin above the eyelashes can be readily be improved with blepharoplasty surgery. Charles Davis has a lot of experience with eyelid surgery and most cases can be done under local anaesthetic as a daystay procedure. The improvement to the eyelid appearance from side on is especially rewarding. Visualising the so called “supra tarsal” skin above the eyelashes from this angle looks much more youthful. When the upper eyelid skin starts to sit on the eyelashes, many people subconsciously raise their brows. Chronic strain of the frontalis muscle that raises the brow causes headaches that fade away after surgery. Mr Davis does upper blepharoplasty for a fixed cost. Combined upper and lower eyelid surgery under local anesthetics is also done for a fixed cost. For the current fixed cost please either email us or phone us on 0800 268 526. The quoted cost for surgery covers everything including theatre fees, consumables and all the follow up for dressings and checks in the first year after surgery. This cost includes GST. If surgery requires a general anaesthetic, an up-to-date estimate is given after a consultation however we would be happy to give you an estimate of the likely range of costs based on recent cases before a consultation. Some insurance companies will contribute to the cost of surgery if it can be demonstrated that you have visual field obstruction as a result of excess eyelid skin. You should check what your policy allows. Can I see examples of Charles Davis blepharoplasty surgery? 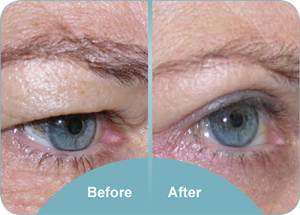 Examples of blepharoplasty are shown during a consultation to illustrate the typical range of results, the limitations of surgery and the placement of the scar. Why do people have upper blepharoplasty surgery? The most common reason for surgery is heavy hooded eyelids. A history of eyelid swelling and chronic rubbing of the eyelids such as can occur with hayfever may cause premature eyelid ageing. If the eyelids are excessively droopy, some people use their brow muscles to lift their eyelids. Chronic brow muscle fatigue leads to frontal headaches which are usually relieved with blepharoplasty surgery. The crowfoot lines are not removed with blepharoplasty surgery. They can be weakened with Botox but some animation is necessary as the underlying blinking muscle (orbicularis) contracts. If this muscle is paralysed too much with Botox it may cause the lower eyelid to become droopy. What are the considerations for upper blepharoplasty surgery? It is important to check that a browlift is not necessary and that there is a sufficient vertical gap between the eyelashes and the brow. A browlift can be done at the same time as an upper blepharoplasty if required. Slight asymmetry of the eyelids and the brow is common. In the brow this is usually because one of the forehead muscles (frontalis) is more active than the other side. People with dry eyes or excessively watery eyes can have exacerbated symptoms if too much skin is removed and spreading of the tear film is interrupted. Sometimes fat inside the eyesocket will cause a bulge on the inner side of the eyelid. This needs to be checked when upright as it will disappear when lying flat during surgery. Can lower eyelid surgery be done under local anaesthetic? If surgery is limited to the skin and muscle layer, surgery can be done under local anaesthetic. For extensive fat pocket surgery or incisions on the inside of the eyelid, a general anaesthetic may be preferred. The excess tissue is carefully measured and marked. The skin is then numbed with a very fine needle. You will not see this. The local anaesthetic contains a substance that causes local blood vessels to contract so there is very little bleeding during surgery and a very clear view of the eyelid structures. The excess skin and underlying blinking muscle (orbicularis) is removed. Any excess fat is trimmed. A stitch is placed beneath the skin and is secured with steristrips over the nose and outer eyelid. This is removed about 5-7 days later. How is lower eyelid improvement made? Lower eyelid surgery is potentially more complicated and improvement depends on a precise anatomic examination of the local structures. Some people have a so-called “negative vector orbit” with the eye forward of the cheek bone position. Tightening the eyelid risks pulling the eyelid down (ectropian). Sometimes a cheek implant will give the best improvement. Sometimes the fat around the eye pushes out into the lower eyelid tissues causing a bulge. If this is the only concern then the fat can be removed using an incision on the inside of the eyelid (transconjunctival incision). This requires a general anaesthetic. Sometimes part of this fat is put back into the “tear trough”, a hollow area beneath the bulge. Excess eyelid skin can be carefully tightened using an incision beneath the eyelashes that extended out into a crowfoot line. The underlying blinking muscle can be tightened and suspended. It is extremely important not too remove too much skin because of the risk of ectropian (pulling down of the lower eyelid). It is normal for some wrinkles to persist in the lower eyelid after surgery because the flat muscle layer beneath this will cause ongoing creases. A vertical internal band of scar pulling the lid down. All these causes of ectropian will improve over subsequent weeks. If temporary ectropian does occur it may resolve faster with an eyelid taping procedure and a massage technique. What preparations are suggested before and after surgery? You are given a detailed instruction sheet after surgery that includes Dr Davis’ contact number if there are any concerns. Do not take arnica before surgery as this will increase bruising. It is fine to start arnica on the evening after surgery if you wish. I recommend getting somebody else to drive you home after surgery. It is a good idea to bring sunglasses with you on the day of surgery. They are a good disguise. We recommend cool packs to your eyes after surgery (we give you these for the drive home) and sitting and sleeping with your head somewhat elevated for the first few days after surgery. This decreases swelling around your eyes. Most people return to desk work later in the same week especially if they can work from home. If your job is in the public eye, you may consider taking up to two weeks off work in case there is some residual bruising. If you wear glasses, these are a good disguise for any bruising and swelling you may have initially. It is sensible to avoid bending over, lifting and heavy straining for the first two weeks after surgery. Also avoid heavy exercise during this time. You should be able to return to normal exercise after this time. Are there other potential complications after upper blepharoplasty? Swelling and some bruising around the eyes is normal after surgery. Often this will be different on each side. Temporary itchiness and watering of the eyes can also occur. The eyes can feel “gritty” for a while and lubricating eye drops from the chemist is helpful if this occurs. When applying mascara and eyeliner after surgery people will be aware of numb areas. This can persist for many months. Uncommonly blepharoplasty could lead to temporary swelling of the layers of the front of the eye and subtle blurring of vision. I have experienced one case that persisted for nearly three weeks. If there is severe pain after surgery or significant bleeding, you must call Dr Davis and return to the clinic immediately. Bleeding into the tissues behind the eye could theoretically cause blindness. I am not aware of a case of blindness in New Zealand and the stated risk is 1:40,000.